The deep space object VV 340, also known as Arp 302, is a textbook example of two colliding galaxies in a crash that will take millions of years. VV 340 is 450 million light-years from Earth. This image, released Aug. 11, 2011. In this stunning space wallpaper, two colliding galaxies, in the early stages of their interaction, form a bright exclamation point in space. The spectacular new photo shows the galactic smash-up, called VV 340, in the early stages of collision. NASA released the cosmic crash scene and a video explaining the galaxy collision yesterday (Aug. 11). In the photo, the edge-on galaxy near the top of the image is VV 340 North and the face-on galaxy at the bottom of the image is VV 340 South. 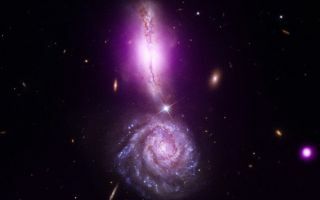 The colliding galaxies, which are also known as Arp 302,are located about 450 million light-years away from Earth. Over the course of millions of years, these two spiral galaxies will eventually merge in much the same way that the Andromeda galaxy is likely to merge with our Milky Way billions of years from now.